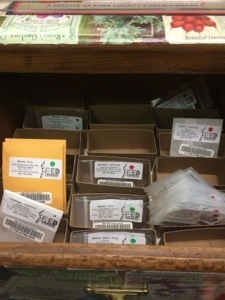 Pima County Public Library Seed library in Tucson, Arizona–drawers full of seeds for the taking. What a great idea for a public library! Opening the seed library with great excitement. The girls did not know what they would find inside. Grandpa Karl studies the seeds. He is looking for something specific. Maybe melons or lettuce–the crops he used to grow the farm at Picacho Peak. Oh yeah, cotton too. 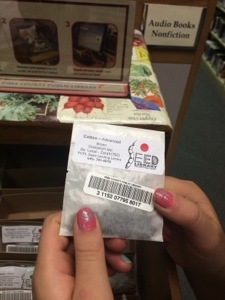 We found cotton seeds in the seed library. 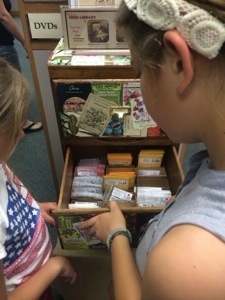 At this library, you can check out books and seeds, too! By harvesting seeds from your garden and bringing them back to the library, you are creating a community, encouraging gardening and fostering sustainability. The plants that grow and thrive in your garden are the strongest for your region. It makes sense to harvest them and plant them again. This practice is ancient. We develop seeds better adapted to our climate and save money too. The harvested seeds are brought back to the library and shared with others. You can “check out” five seed packs a month. Hopefully, you will collect your seeds at harvest and bring them back to share with others. 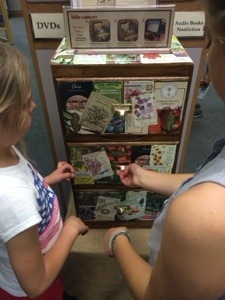 At the library, you can learn different seed harvesting techniques. Also try http://www.seedsavers.org. There are three ways to save seeds: dry seed processing for plants that grow seeds on the outside of the plant such as sunflowers or peas. Wet seed processing is for seeds that grow inside the fleshy fruit of the plant. Rinse them off and let them dry. If the seeds have a gel-like coating, then use the fermentation process. This requires mixing them with water in a jar and allowing them to ferment (grow mold.) It’s a little complex but sounds fun to try. This is for tomatoes, cucumbers, squash, etc. 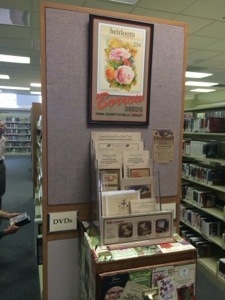 For more information, contact Seed.library@pima.gov. 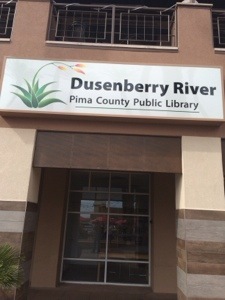 Also try http://www.library.pima.gov/seed-library I wish I had this at my local library! Here we have SLOLA. http://slola.org/ I wonder how long the cotton seeds have been there, since almost all cotton in this country is GM (and since it all gets processed together in the gin, technically it’s all GMO. Be interesting to see what heirloom cotton looks like. I see SLOLA on the list on the library link. 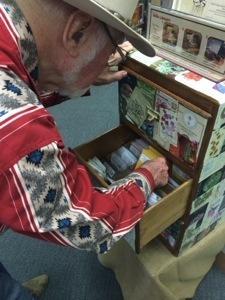 It looks like the Bay Area has a lot of these seed libraries too. I know they don’t want you to cross-pollinate and it seems like something you need to study up on before trying. The cotton might be from seeds donated by Native Seed Search–they are a partner in this project.